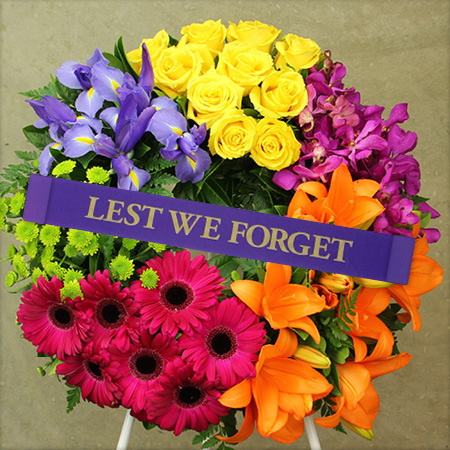 If you are planning on attending an Anzac Day service on April 25th, this contemporary, rainbow-coloured floral wreath is a lovely option for laying in commemoration and respect. Our wreath features hot pink gerberas, bright yellow roses, orange lilies, purple orchids, blue iris and green chrysanthemums. Available in three sizes, you can order this Anzac Day wreath online or by calling 1800 66 66 46.